Condo resale prices, meanwhile, are up 3.3% in the past year to $628 a square foot in downtown L.A., according to Polaris Pacific, a San Francisco-based real-estate sales and marketing firm. By comparison, resale prices for all condos in L.A. County were flat during the same period, Polaris said. 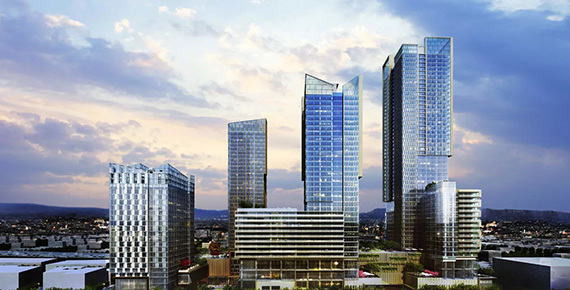 Chinese developers are among the busiest in downtown L.A. They include a subsidiary of Greenland Group, which is building a $1 billion cluster of towers named Metropolis, and Oceanwide Holdings, which plans to complete a complex in 2019 that will include 504 condos, a Park Hyatt hotel andmore than 166,000 square feet of retail. Condo development in Downtown Los Angeles is at an all-time high since the recession, according to the Wall Street Journal. Nearly 2,000 new condos are under construction or on the market, some of which are going for over $1,000 per square foot, insiders told the Journal. Prices for existing downtown condos are also up 3.3 percent over the past year to $628 per square foot, according to Polaris Pacific. Nearly 80 percent of the 308 units in the first of three towers at Greenland USA’s Metropolis project are in contract, according to Cory Weiss, an executive vice president at Douglas Elliman Development Marketing, which is marketing the project. The second tower, slated to open next year, is 30 percent in contract, he said. Approximately 100 of the 151 units at TEN50, Trumark Urban’s 25-story condo building at 10th Street and Grand Avenue, are spoken for at prices ranging from $600,000 to $4 million, according to Trumark’s managing director Arden Hearing, putting the company ahead of schedule on sales. Industry insiders point to oversupply in the rental market and insufficient condo inventory in DTLA. This year’s Real Estate Deals of the Year winners include big names in Bay Area real estate such as Tishman Speyer, Harvest Properties, Swift Real Estate Partners and Equity Residential. There are blockbuster Financial District leases with red-hot tenants and soaring luxury residential towers in SoMa as well as transit-oriented affordable housing next to BART. We’re also celebrating trophy retail properties in Union Square and the biggest industrial lease in the history of the East Bay. You’ll notice that last year we changed the format of these awards. Instead of celebrating both finalists and winners, we’ve now chosen only winners. We have 24 winners plus seven “superlative” awards, including Broker of the Year, Dealmaker of the Year and Deal of the Year. A special Housing Champion Award was also added this year. It was tough to pick the top projects and deals among more than 100 nominations. We tried to focus on the biggest and most significant among them. Congratulations to our winners for your vision and tenacity in getting these projects built and deals done. You can see each of the winners and related video content here. About 60 percent of the units in Ten50—the 25-story condo tower in Downtown LA’s South Park neighborhood with a drone landing pad—have been scooped up after sales launched last year, says Los Angeles Downtown News. The tower at the corner of 11th and Olive streets opened last month, and developer Trumark Urban expects to have all the units in Ten50 sold by the end of this year, managing director Arden Hearing told the News. “We’ve got people paying $4,000-6,000 in rent all around us,” Hearing told the News. Ten50 is “an amazing opportunity to get ownership” in Downtown, he said. It’s one of a small but growing crop of Downtown condos available in a neighborhood where most new units are available to rent, not to own. The Downtown market seems poised to be heavily rental-focused: A Downtown Business Improvement District report released this month found that in the fourth quarter of last year, 7,645 new residential units were proposed for DTLA. Only 1,200 of them were condos. There are condos on the market at the nearby Metropolis development (with more on the way), but the price point there is a bit higher per square foot than the ones still available at Ten50, which “average about $1,000 per square foot,” says the News. Hamid Behdad, the president of the Central City Development Group, suggested that Ten50 prices are lower than Metropolis’s “in part because Trumark Urban was able to buy the land already entitled, which helped keep development costs down,” the News reports. For those clamoring to buy a new condo Downtown, fear not: There are more coming online in South Park, at additional towers at Metropolis and at Oceanwide Plaza, which will have over 500 new condos. 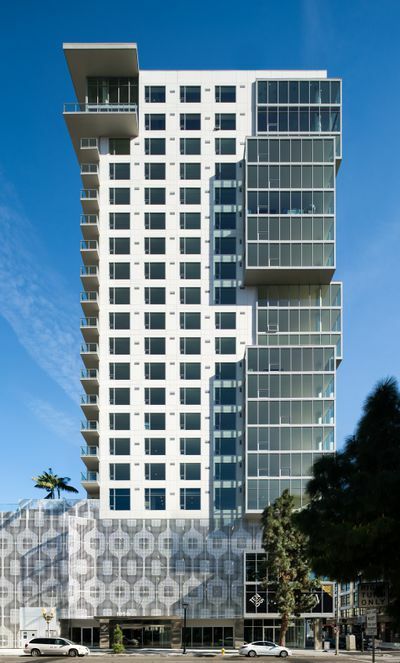 At Ten50, residences range from 679 square feet to 1,380 square feet. 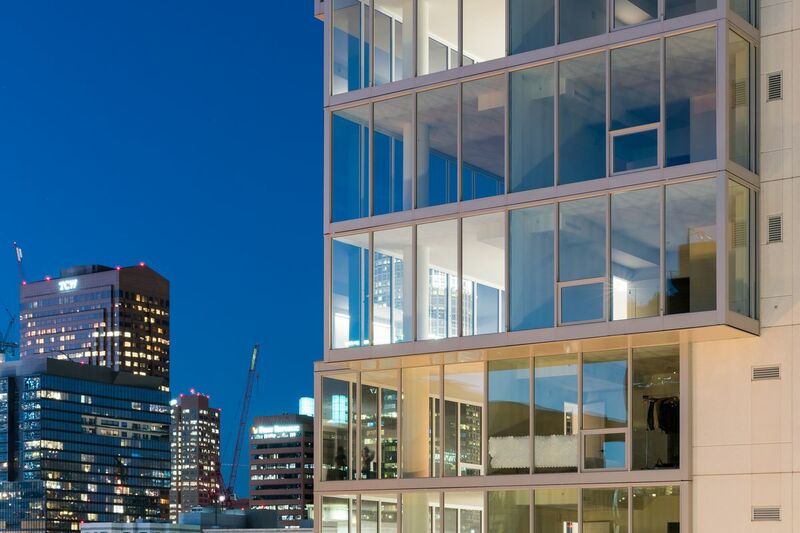 The six penthouses are in a different league, ranging from 1,117 to 3,575 square feet. Two of the penthouses are two stories tall. Aside from the landing pad from drone deliveries (which has yet to be utilized), residents can enjoy a yoga deck, and a pool and spa on the sixth floor amenity deck. The project was designed by Douglas Hanson, president of HansonLA. When Curbed visited the then-under-construction tower, the least expensive units were asking around the low $600,000s. Those units appear to have been snatched up quickly. Among the condos that are still available in Ten50 are a two-bedroom condo on the ninth floor, which is listed for $879,000, and a “similar-sized” condo up on the 17th floor that’s asking $1.1 million. A few penthouses appear to be available, too. They can cost up to $4 million, says the News. On Deck: Arden Hearing sits poolside at the Ten50 condo tower downtown. Photo by Ringo Chiu. When developer Arden Hearing was trying to finance his Ten50 condo tower downtown, many investors told him to build apartments instead. With the effects of the Great Recession still lingering, a time when condos sat unsold and prices were slashed to lure buyers, the smart money was on rentals. But Hearing wasn’t convinced. Ten50 is at the forefront of a wave of condos set to hit the market in the next few years. Reports put the number of units under construction downtown between 2,100 and 2,500. An additional 2,270 units have been approved, according to condo sales and marketing firm Polaris Pacific of San Francisco. About 5,200 more condos have been proposed, according to the Downtown Business Improvement District, which pegs the total inventory of completed units at more than 5,600. Ten50, located at 1050 S. Grand Ave., has sold slightly more than 100 out of 151 units in its 11 months on the market, according to Hearing. Listing prices range from $600,000 for a one-bedroom condo to more than $4 million for a penthouse. Residents started arriving in late February, the first to do so at a downtown condo tower since the 2008 opening of Evo South at 1155 S. Grand. While that project eventually sold out, there were challenges. The tough economic situation led several developers to convert condo projects that came on line during the recession into apartments. But downtown has evolved since the recession, with tens of thousands of people flocking to the area along with jobs, transportation, amenities, entertainment, and housing. The steep price increases in the downtown market reflect that growing popularity. The median sales price of a condo there is $633,000 – up from $251,000 in 2012 – an increase of 152 percent, according to Redfin. The median sale price for the L.A. metropolitan area as a whole is $536,000 – an increase of 85 percent since 2012. SAN FRANCISCO, CALIF. (March 9, 2017) –Trumark Urban has just announced the rollout of the largest and most advanced application of virtual reality in residential real estate to date at The Pacific, the award-winning luxury residences in San Francisco’s exclusive Pacific Heights neighborhood. Inspired by the stunning architecture of Glenn Rescalvo at Handel Architects and interior design by Handel Interior Design, Trumark Urban has enlisted digital creative firm Steelblue to visually simulate the Penthouse Collection at The Pacific. Via Samsung Gear VR headsets, owners can explore the building’s fully designed penthouses, which are being sold as completely customizable shells at list prices rising above approximately $4,000/square foot and reaching over $18 million for the 3,000 to 4,000 foot homes. From the sunrise gleaming off the exquisite kitchen surfaces to visualizing the sun set within the elegant west-facing living room, this build out presents “a look to the future” never before seen in residential real estate. Potential buyers can transport through numerous 360 degree panoramic views and touch points of both the grand penthouse collection and the property’s generous amenity spaces. The Pacific Penthouse Collection is comprised of seven penthouses and four grand penthouses, which are 50% sold. Most penthouses come as custom shells, enabling buyers who want to be involved in every aspect of the design process to fully customize every detail, from the floor plan to the showerheads. With floor plans ranging from approximately 2,100 square feet to 4,000 square feet, or up to 8,000 square feet with the opportunity for expansion by purchasing multiple penthouses, the Penthouse residences allow for an ultimate freedom in home design. Sales for the building’s 76 residences, led by West Coast sales and marketing firm Polaris Pacific, launched late last summer, and The Pacific has seen 75% of residences swept up since then, across an array of one-, two- and three-bedrooms flats and three-level townhomes. Each residence features distinctive entertaining spaces, chef’s kitchens, up to 11-ft ceiling heights and floor-to-ceiling windows with picturesque views of San Francisco that span from the Bay, the Golden Gate Bridge, the Presidio, the Marin Headlands, Tiburon and Sausalito, to the Island of Belvedere. The Pacific offers a full range of amenities including private vehicle valet, full service concierge, lobby attendant, a private Observatory Lounge overlooking the Bay and Golden Gate Bridge, a private guest residence called ͞The Fillmore͟, and a world class fitness center. Pricing for the residences starts from under $2 million and ranges up to $18 million.